On 13 March 120 participants gathered in Brussels to discuss the outcome of the work of the European Defence Skills Partnership (EDSP) on a common vision on defence-related skills to solve today’s and tomorrow’s skills gaps in Europe. The main aim of the event Towards a European Defence Skills Strategy organised by the European Commission was to focus on the way forward in advance of the new Commission that will be setting priorities for 2019-2024, as well as on solutions to be implemented at the European, national and regional levels. • we need to use the European Structural and Investment Funds to support clustering and develop training and up-skilling, including in new technologies. Although projects are already happening, we need to raise awareness of Managing Authorities about the potential of ESIF to fund projects for the defence sector through ESIF. The European Commission asked the participants to send concrete ideas and proposals on a future European defence skills strategy by end of May to GROW-I4@ec.europa.eu. At the EDSP Annual Assembly that took place following the panel discussions, members discussed concrete future actions. Information on these will be made available on www.eudsp.eu. “Your career in the defence industry” is the title of the brochure prepared by Rand Europe under the EDSP project financed by COSME. It highlights the industry’s role in Europe’s future as high tech player and the opportunities it offers to young talents. The sector is highly innovative and deals with cutting edge technology offering to youngsters an exciting career contributing to the security of the citizens. Following the launch of the European Defence Skills Partnership (EDSP) on 19 June 2018, the European Commission is bringing the defence community again together in a high level conference on 13 March 2019. Participants will discuss the outcome of the work of the EDSP on a common vision on defence-related skills to solve today’s and tomorrow’s skills gaps in Europe. The event will feature high level speakers and provide the opportunity to discuss the way forward in advance of new Commission that will be setting priorities for 2019-2024. Go to conference programme and registration. Vision on defence related skills for Europe today and tomorrow report is now available! In the first stage of the project, the research team built the evidence base on defence-related skills and delivered a state of play report Vision on defence related skills for Europe today and tomorrow, with significant contribution from the experts and stakeholders of the European Defence Skills Partnership. This report presents the European defence industrial skills landscape and highlights the skills which will be needed in future, while also identifying the defence market dynamics and technological development trends shaping these requirements. This research then identifies defence-related skills gaps and shortages and highlights challenges with different sets of skills, in different defence domains and across the stages of the defence equipment life-cycle. In addition to the main report, an Overview of selected literature on defence-related skills provide an overview of selected research on the sustainment and development of defence-related skills, including an overview of publications produced by global consultancies. Country profiles annexes provide an in-depth analysis on the skills state of play in: Germany, Denmark, Spain, Finland, France, Italy, Netherlands, Poland, Sweden, and the UK. This work also produced the Technical annex that provides a detailed description of the methodologies used to produce the report; a List of identified relevant defence related skills programmes and initiatives, mapping the existing and planned EU, national, regional, and industry-led policies, programmes and initiatives aimed at the sustainment and development of defence-related skills; and the new revised Taxonomy of defence skills. Following the launch of the European Defence Skills Partnership (EDSP) on 19 June 2018, the European Commission is bringing the defence community again together in a high level conference on 13 March 2019. Participants will discuss the outcome of the work of the EDSP on a common vision on defence-related skills to solve today’s and tomorrow’s skills gaps in Europe. The event will provide the opportunity to discuss the way forward in advance of new Commission that will be setting priorities for 2019-2024. More information on the conference and registration will become available early January on www.eudsp.eu. Presentations videos and slides will be soon available here. KETs should be addressed according to the new Information note available here. Involve organisations with deep knowledge. Be ambitious and pragmatic. Read Programme Guide carefully. Consider the award criteria. Start filling-in the online proposal already now. The application is complex and takes time. Divide the work among partners. One may be applicant for several proposals. An online ‘Info Session’ on the Erasmus+ Sector Skills Alliances call will be held on 6 December from 14:00 – 16:30. During the webinar, European Commission and EACEA representatives will explain new funding opportunities, the policy framework and provide advice on preparing applications. The Summary report of the "Vision on defence-related skills for today and tomorrow" resulting from the skills data collection and analysis conducted during summer and autumn is available online. It summarises the skills required by the defence sector today and in the future, identifies defence-related skills mismatches, and outlines the European skills supply landscape. The European Defence Skills Partnership played an instrumental role contributing and providing feedback during the entire exercise. The report findings will feed into the European defence skills strategy expected in March 2019. The European Defence Skills Partnership met for the fourth workshop on 14 November in Brussels. The research team led by RAND Europe presented the findings of the report on "Common vision on defence related skills for Europe today and tomorrow". A first short presentation of the findings is available here. Taking stock of the research findings to date, but also looking ahead, the group discussed the implications of the identified skills gaps. During the second part of the workshop, EDSP members reflected upon concrete supporting actions that industry, educational institutions, national governments and EU institutions could take to address skills gaps at the EU level. The group agreed that investing in the transferability of skills and in the adaptability of the workforce, as well as in the design of training modules and in the creation of an EU-level accreditation system for training and education institutions are initiatives that a more integrated defence community should pursue. EDSP experts will meet again in Brussels during the first week of December for a series of working sessions on specific topics that will feed into the European Defence Skills Strategy expected in March 2019. An information and matchmaking session on the Erasmus+ call for Sector Skills Alliances Lot 3 on defence technologies, open to all interested parties took place back to back with the EDSP workshop on Wednesday 14th. The slides presented are available here. An info-day on the Erasmus+ call for Sector Skills Alliances Lot 3 on Defence Technologies will take place on 14 November in Rue de la Science 14b at 10.00. Presentations on requirements and hands-on information on how to prepare an application followed by Q&A will last until 11.00. Matchmaking and consortia building opportunity among participants will follow. To participate, please register by sending an e-mail to defenceskills@rand.org. Defence is one of the eligible sectors under the 2019 Erasmus+ call for Sector Skills Alliances Lot 3, published on 24 October. One successful selected proposal can be awarded a €4 million grant for 4 years. Project proposals should address at least 2 of the following areas: a) complex weapon systems, b) ballistics, c) robotics, autonomous systems, artificial intelligence and d) C4ISTAR (command, control, communications, computers, information/intelligence, surveillance, targeting acquisition and reconnaissance). The call is published on the Official Journal 2018/C 384/04 of 24.10.2018. The deadline for submission of proposals is 28 February 2019. All information on the detailed conditions of this call is found in the Programme Guide 2019. See from p. 144 on for Sectors Skills Alliances and from p. 153 about Lot 3. Information includes eligible organisations, consortia minimum requirements, specific requirements for defence technologies etc. For the practical Guide to Apply see Part C in p. 251. The European Defence Skills Partnership met for the third workshop on 18 September in Brussels. Members representing industry and academia discussed the findings of the research to date, and examined differences and similarities in the industrial base and the approach to defence skills across several EU countries. They commented on the survey preliminary results presented by the research team and discussed how to address the challenges identified and which mitigation measures should be recommended by a European defence skills strategy. Input gathered will feed into the comprehensive mapping and analysis on the current situation of the skills gap in the European defence sector and anticipated gaps in the next 5-10 years. The results of this exercise will be presented in the report on "Common vision on defence related skills for Europe today and tomorrow" expected in October. Survey on defence-related skills launched! The survey aims to collect and analyse data within the project on Defence Related Skills carried out by Rand Europe. The input gathered will feed into the comprehensive overview of skills gaps in Europe drafted in October 2018. 1. Questions exploring general defence industry skills gaps today and as anticipated by you in future, the criticality of specific defence skills for your organisation and issues with filling vacancies for these skills and the effects of having these skills gaps on your organisation. It also covers domain-specific skills based on your area of expertise as indicated by you in the introductory part of the survey. 2. Questions on skills associated to new technologies and related current and potential future skills gaps. The next EDSP working group meeting will take place on Wednesday, 18 July 2018, in Brussels. This second workshop will review the findings to date regarding gaps and problem areas in the supply of prioritised skills as well as the effectiveness of policies and initiatives aimed at skills support and development across Europe, with a focus on education and training initiatives and policies. Inputs will feed into the "Common vision on defence-related skills for Europe today and tomorrow", which is expected to be published in October 2018. 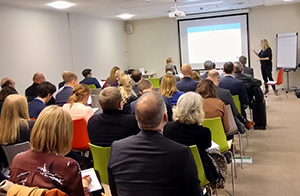 The first EDSP working group meeting, in the occasion of the launch of the European Defence Skills Partnership on 19 June saw a large number of interested participants. EDSP members provided considerations about present skills deficiencies from their different perspectives. They discussed the level of alignment of supply and demand in defence skills, performance indicators for training programmes, and the way future skills demands will be influenced by emerging technologies. The precious inputs will feed into the comprehensive mapping and analysis on the current situation of the skills gap in the European defence sector.